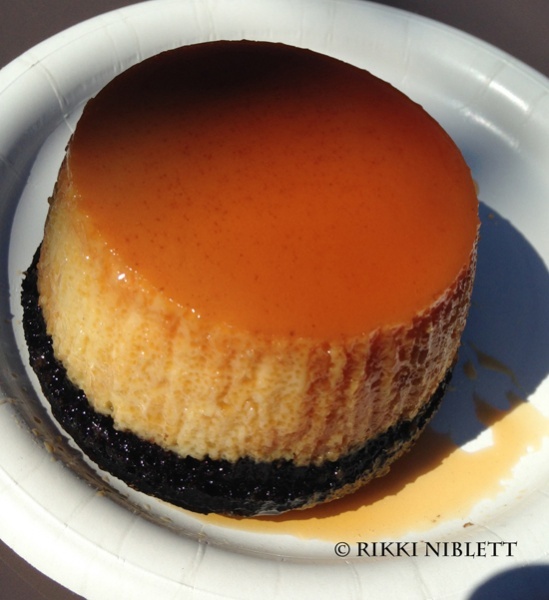 The Epcot Food and Wine Festival really is one of the best times of the year and this year, I was able to make a couple of stops at this year’s event. Having gone to the festival over the past several years, I feel as though a lot has changed this year, but also that a lot of standards have remained the same. This is great news for those of us who return year after year, because we get to have different experiences, but can also be sad when one of your favorite dishes doesn’t make a return. While walking around at this year’s festival, I was able to try quite a few new things, as well as a few favorites from year’s past. Most of what I sampled were hits, there were only a few misses and I’m ready to share a little bit of both with you! 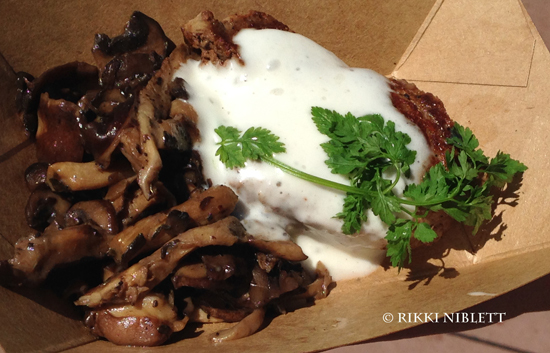 One of the perennial favorites for the Festival is the “Le Cellier” wild mushroom beef filet mignon with truffle butter sauce. It is cooked a little more than I prefer (I’m a medium rare girl), but it wasn’t chewy and the sauce was ridiculously good! The mushrooms weren’t really a garnish like I thought they would be, instead I would consider them more to be like a “side” of mushrooms. Not being a huge mushroom fan, they did add a nice flavor when paired together with the steak and the sauce. 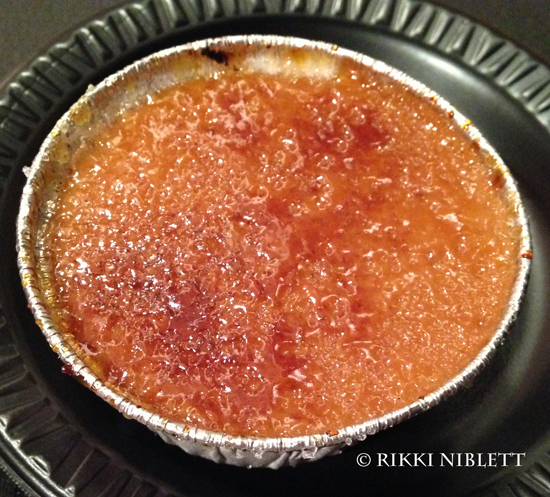 In France, I decided to try the Crème brûlée caramel fleur de sel (Sea salt caramel crème brûlée topped with caramelized sugar). I am a big fan of crème brûlée, and I always loved the milk chocolate version they had had in previous years, so I decided to give this one a go. It was excellent, but wow…it was super rich. 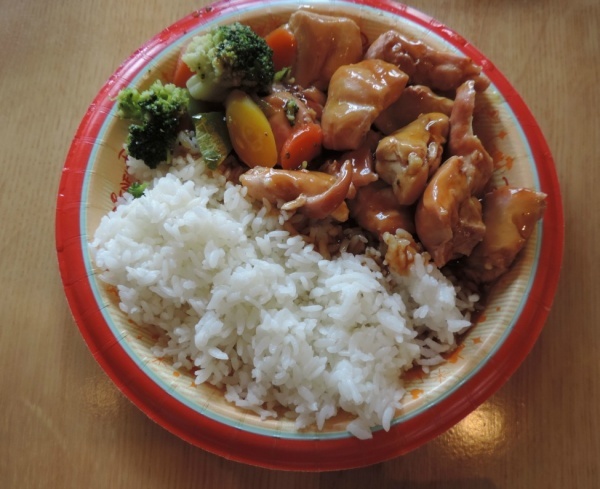 We stopped to relax with the treat at the Japan Pavilion in the seating area for Katsura Grill and grabbed some waters and I was glad we did! I needed it to handle the sweet factor. It was so good, but I suggest that you share this one. 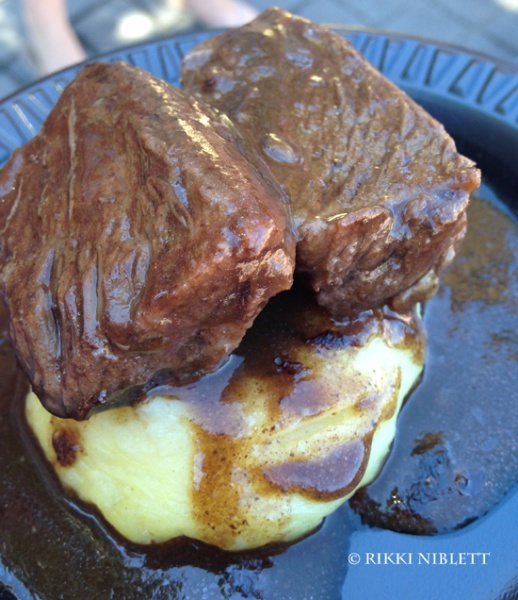 On another stop at the France Marketplace Booth, I got a favorite of mine, the Boeuf bourguignon (Braised short ribs in cabernet with mashed potatoes). It was so great and the meat was tender. The cabernet sauce was a perfect sort of gravy, but I wish the mashed potatoes had been a bit creamier. Despite that, it’s still a favorite. We also made a stop at the Hawaii booth for the infamous Kalua pork slider with sweet and sour Dole Pineapple chutney and spicy mayonnaise. This little mini sandwich has juicy pork, and the tang of the pineapple chutney is fantastic. I didn’t really get much from the mayo, but everything did tie together nicely. One of the standout booths was the Puerto Rico booth. Wow, they did a fantastic job on this one. It has it’s own courtyard, a fantastic booth design, and great music. I decided I wanted to try two dishes here. The first was the Tostones. 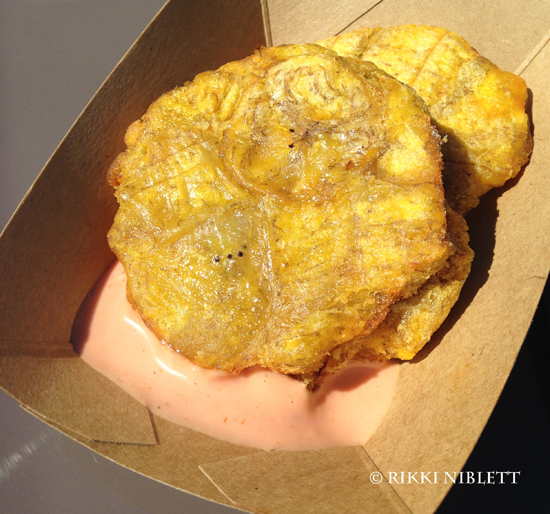 These are fried green plantains served with mayo ketchup. These were also a late addition, because something else had previously been announced for the booth in its place. 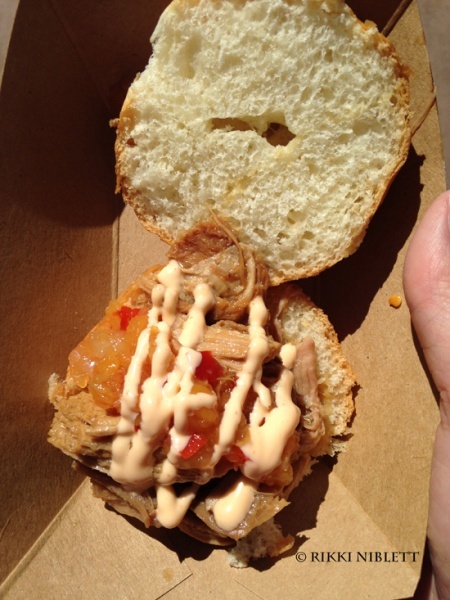 This was also, by far, the worst thing I had at Food and Wine. It was legit terrible. My neighbor made me tostones for the first time not long ago and I am a huge fan of plantains; these were not good. They were hard and had no flavor what-so-ever. Even the mayo ketchup didn’t help in any way. This is the one dish that I’m going to tell you not to spend your money on. On the other-hand, I also tried the FlanCocho (Vanilla caramel custard with chocolate coffee cake) and this was fantastic. It was much larger than I thought it would be and it had much better flavor. The chocolate coffee cake was fantastic and there was a caramel sauce that was perfect with it all. This wasn’t as gelatin as I was expecting, instead it was more a consistency of cheesecake and it was perfect. This one is a major win. By far though, my favorite booth was the Hops and Barley booth! Holy cow. First, I tried the Baked lobster alfredo. This was fantastic. 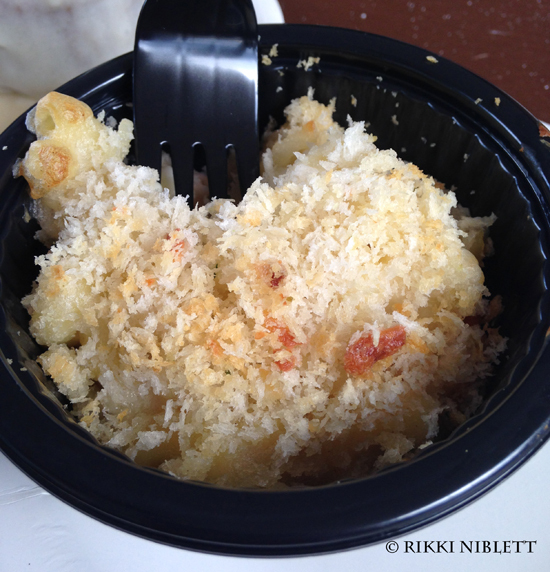 Plus, there were large chunks of lobster, and the breadcrumbs on top were a great crunchy touch. But my favorite thing out of everything I tried this year was the fresh baked carrot cake with Craisins and cream cheese icing. Oh…my….god. 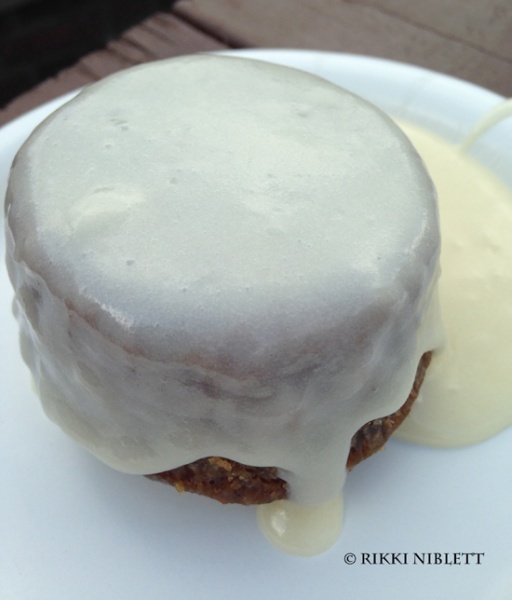 This was moist, warm, the Crasins were a fantastic addition, and the icing…can I just say it was the best part? It was literally ladled onto the top of my cake and it was gooey and rich, but in a good way. I actually had this treat twice…that’s how good it was! I’m hoping that Disney brings this one back next year, but the Hops and Barley booth typically has frequent turn over of options yearly. 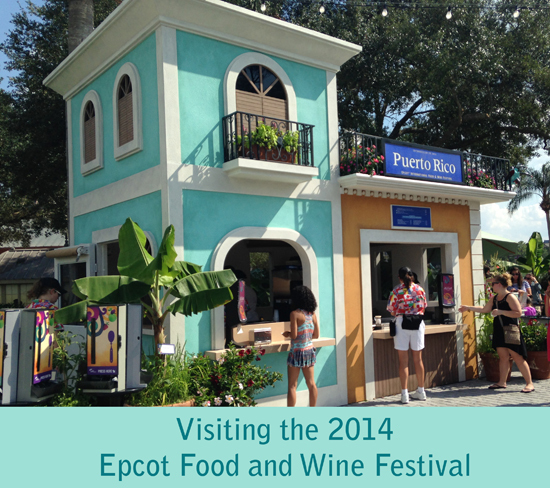 So, that was my experience with the Epcot Food and Wine Festival this year. For those who would like to find our more about the Epcot Food and Wine Festival overall, make sure to visit our page all about the event. In addition, if you’ll be heading down there and want to see the Marketplace Booth menus, we’ve got those too!